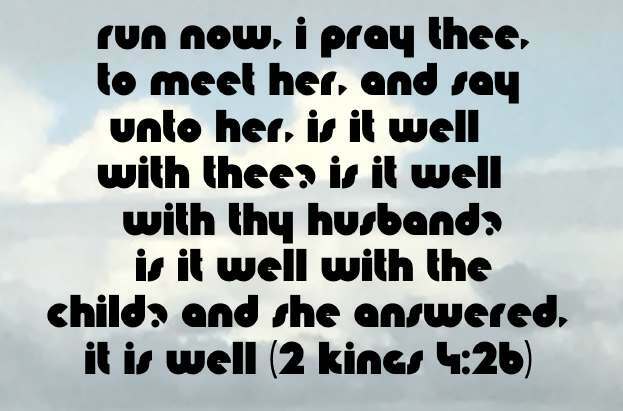 "It is well" was the response the Shunammite women gave Gehazi, Elisha's servant when Gehazi ran to meet her when she was on her way to the man of God in her life, Elisha, to tell him that her son was dead (2 Kings 4:26). We have to ask ourselves "what kind of faith in God would it take to be in that situation for us to respond in that manner?" In this study, we will try to answer this question. (The complete story of the Shunammite woman is given in 2 Kings 4:8-37 and 2 Kings 8:1-6). According as his divine power hath given unto us all things that pertain unto life and godliness, through the knowledge of him that hath called us to glory and virtue: Whereby are given unto us exceeding great and precious promises: that by these ye might be partakers of the divine nature, having escaped the corruption that is in the world through lust (2 Peter 1:3-4). And beside this, giving all diligence, add to your faith virtue (moral excellence); and to virtue knowledge; And to knowledge temperance (self-control); and to temperance patience; and to patience godliness; And to godliness brotherly kindness; and to brotherly kindness charity (agape love) (2 Peter 1:5-7) (Italics are mine). As I said above, in this Bible study, we will explore the story of the faith of the Shunammite woman so that she could respond "it is well" when her son was dead. We will see that she displayed the characteristics of being the Christian that Peter wrote about in 1 Peter 1:5-7. One day Elisha went to the town of Shunem. A wealthy woman lived there, and she urged him to come to her home for a meal. After that, whenever he passed that way, he would stop there for something to eat (2 Kings 4:8 NLT). 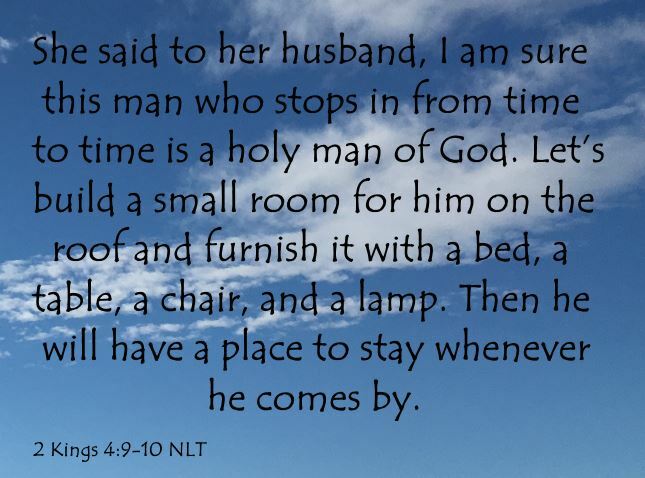 She said to her husband, “I am sure this man who stops in from time to time is a holy man of God. Let’s build a small room for him on the roof and furnish it with a bed, a table, a chair, and a lamp. Then he will have a place to stay whenever he comes by.” (2 Kings 4:9-10 NLT). 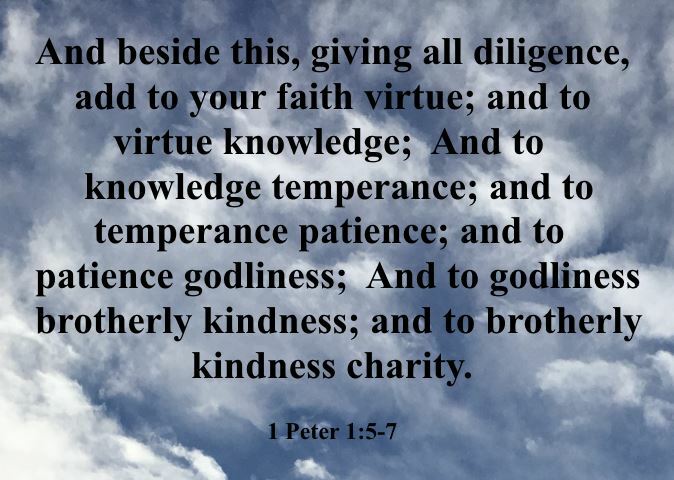 In addition to brotherly kindness, these verses also display virtue, knowledge, godliness and charity that Peter wrote about. Her virtuosity stood out in that the decision to build the room for Elisha, was made jointly with her husband for the sole purpose of providing a place for the holy man of God to stay when he came to town. Recognizing that Elisha was a man of God was knowledge she possessed. When Peter wrote the word knowledge, he was talking about "the knowledge of things which belongs to God". She had certainly known that Elisha belonged to God. Providing food and lodging for Elisha also showed her and her husband's godliness, or piety or reverence to that which is God's. Charity or agape love means "affection, good will, benevolence, brotherly love". The very act of providing food and building an en-suite to one's house for the man of God in our lives, is a clear demonstration of agape love. .... And she said, Nay, my lord, thou man of God, do not lie unto thine handmaid (2 Kings 4:16). While her husband had grown old, she had patiently waited all those years to have a child. She had never done anything rash, always being in control of her emotions and desires (temperance). God rewarded her for her faith by giving her a son. Personally, I have seen women leave church, not having the patience and temperance necessary for God to put a Christian man in their lives to marry and have children with. Most have never returned to God when they follow that path. Run now, I pray thee, to meet her, and say unto her, Is it well with thee? is it well with thy husband? is it well with the child? And she answered, It is well (2 Kings 4:26). Elisha distinguishes that "her soul is vexed" (2 Kings 4:27) and she exhibits her "it is well" faith by reminding Elisha that he was not to deceive her about having a son (2 Kings 4:28). Elisha immediately sends Gehazi with Elisha's staff to lay upon her son (2 Kings 4:29, 31). But the Shunammite woman, exercising her patience and temperance, waited with Elisha until Elisha made the journey to her home (2 Kings 4:30). In the end her faith paid off as Elisha healed her son (2 Kings 4:32-36). She was a grateful woman, displaying her godliness (2 Kings 4:37). The story of the Shunammite woman continues in 2 Kings 8:1-6 when Elisha advises her of a coming famine. She leaves her home and land and sojourns for seven years in the land of the Philistines. She patiently endures the seven years and returns to her home to ask the king to restore her house and her land. As it happens, when she approached the King, Gehazzi was telling the king about the miracle Elisha had performed in restoring her son's dead body to life. She asked the king in faith for restoration of her land and house. He not only did that but he also restored "all the fruits of the field since the day that she left the land, even until now" (2 Kings 8:6). In conclusion, the Shunammite woman demonstrates the characteristics that faith generate: virtue, knowledge, temperance, patience, godliness, kindness, brotherly love and charity. As Christians, we always want to be able to say "it is well" no matter what circumstances are prevalent in our lives.